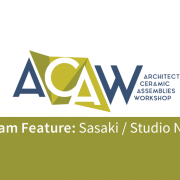 This blog is part one of our ACAW Re-Cap series, detailing the teams and their prototypes during the third-annual Architectural Ceramic Assemblies Workshop. 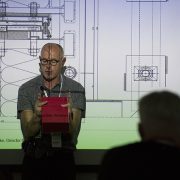 The third-annual Architectural Ceramic Assemblies Workshop proved to be an excellent opportunity for furthering the advancement of bioclimatic building solutions. Boston Valley Terra Cotta in partnership with the University at Buffalo School of Architecture and Planning and the UB Sustainable Manufacturing and Advanced Robotic Technologies (SMART) coordinated in bringing this event to life, once again providing participants a chance to further their understanding of architectural ceramics. 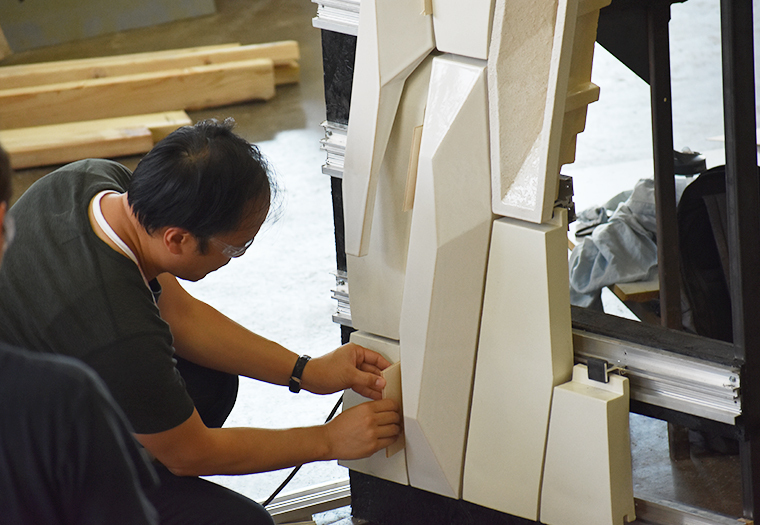 Participants from the six teams, comprised of experts in the industries of architecture, engineering, and ceramics, came together in pursuit of knowledge and explored the materiality of terra cotta for architectural applications. At the end of the week-long workshop, the teams came together for the final presentation of their work. 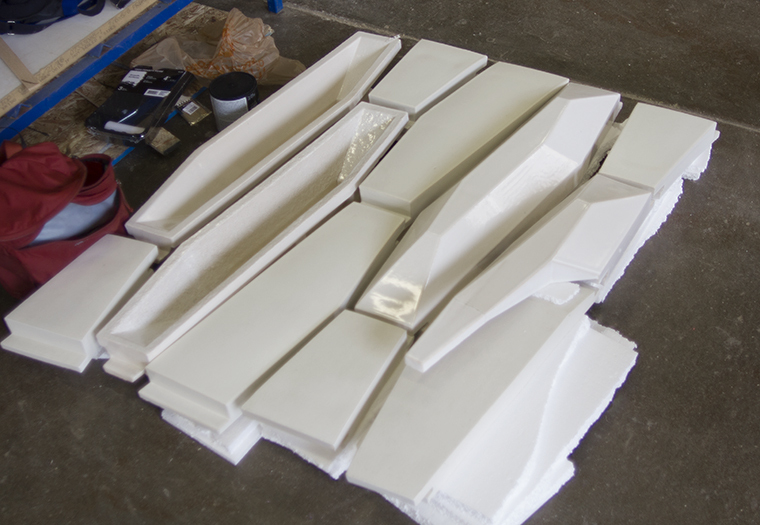 Below are images of the completed prototypes developed by teams at the Architectural Ceramic Assemblies Workshop. Team Morphosis’ curtainwall prototype being installed on an aluminum track system. 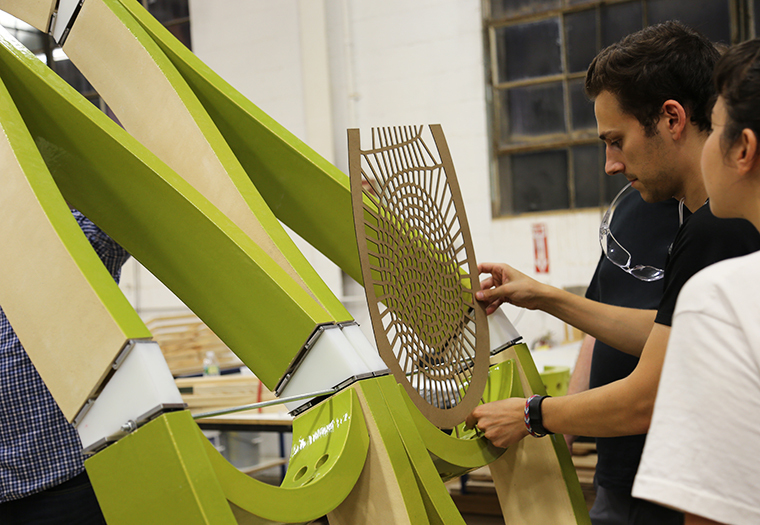 Team Morphosis’ modular terra cotta units in a dry-fit mockup. The prototype developed by Team Morphosis is an exploration of complex facade assembly comprised of unique modular units. 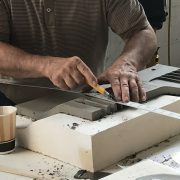 The terra cotta profiles were manufactured using the slip cast forming method to create the varied unit profiles; flat, protruding, cantilevered and open. The terra cotta units can be installed on a standard track system and for a unitized curtain wall system; this rainscreen is designed to transition from opaque to porous conditions. SHoP Architects explored innovation in terra cotta roof tiles, seeking functionality through the distribution of water. Team SHoP Architect’s 3-d printed model for their terra cotta roof tile prototype. 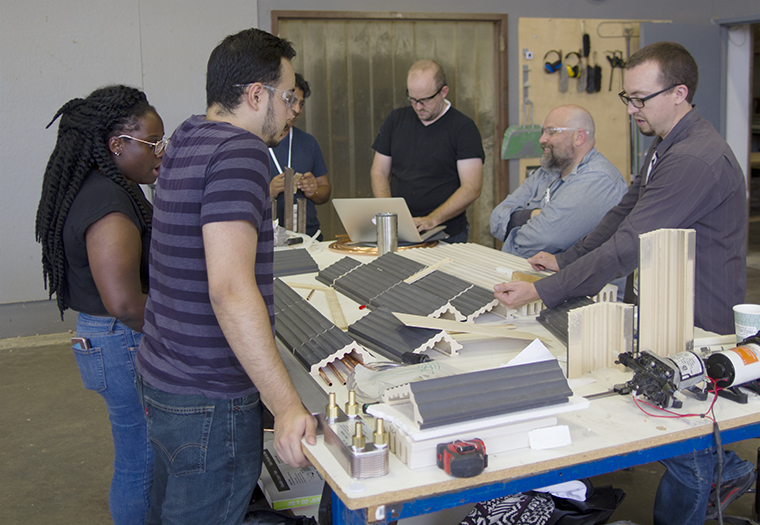 Team SHoP Architects came to the 2018 ACAWorkshop with a desire to explore innovative ways to utilize terra cotta roof tiles to capture and redistribute water. 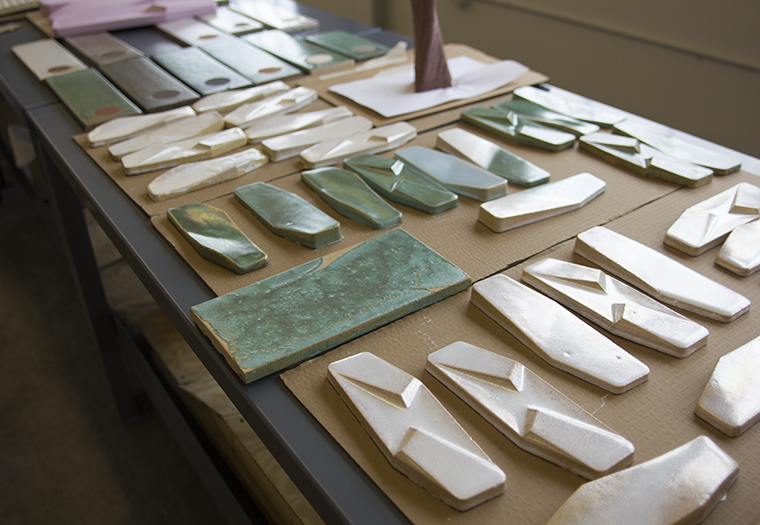 The final prototypes are made of interlocking modular tiles finished with distinct glaze treatments. The shape of the tile was developed to encourage dramatic solar gain reduction and the horizontal interlocking system of tiles offer a variety of spatial configurations including a self-contained spherical pavilion. 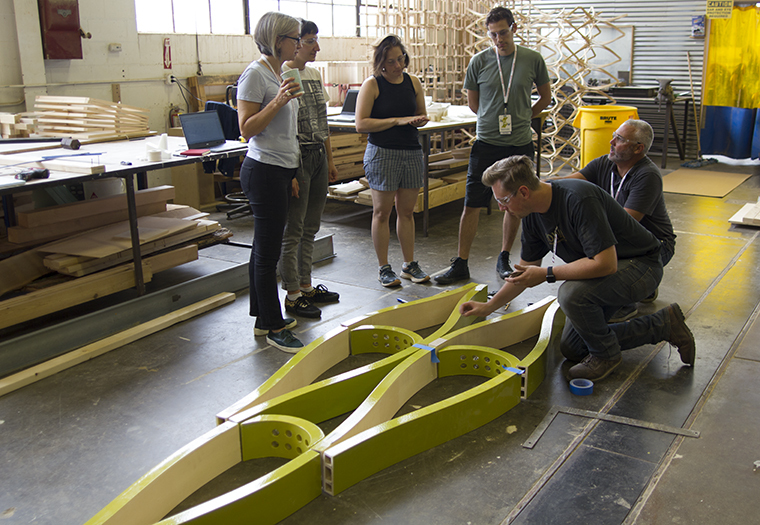 Team Sasaki/Studio gathered around their terra cotta sunshade prototype. Team Sasaki/Studio NYL testing an insert for their self-supporting sunshade structure. 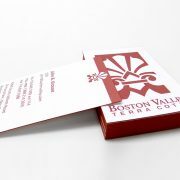 The prototype developed by Team Sasaki/Studio is the result of advanced computational design software, digital fabrication techniques and the advanced manufacturing technologies of Boston Valley Terra Cotta. 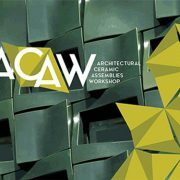 The unique form created for ACAW is a mockup for what will become a fully developed load-bearing sunshade structure. When completed, the terra cotta sunshade will be a fully self-supported, relying on the design of the structure itself instead of being attached to track system. 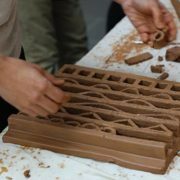 Their prototype questions the use of terra cotta as decoration by focusing on the functionality of the structure. 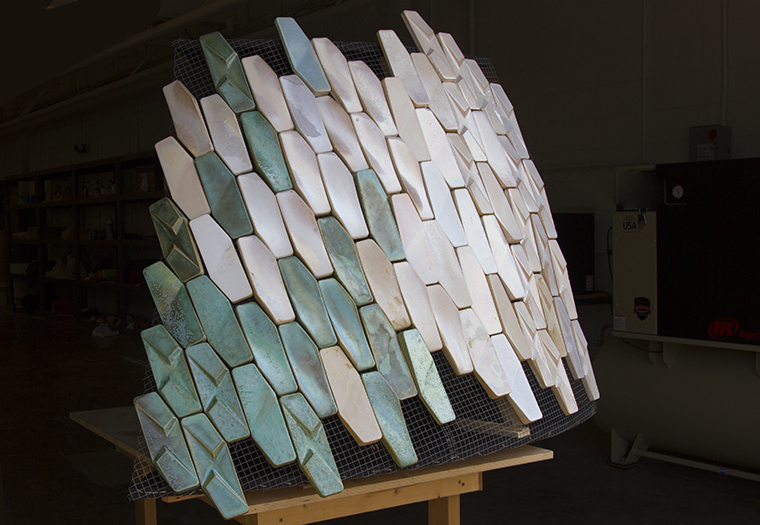 Team UB created a prototype featuring techniques of passive illumination, using the iridescent glazes developed by Christine Jetten. Team University at Buffalo’s glaze test tiles. 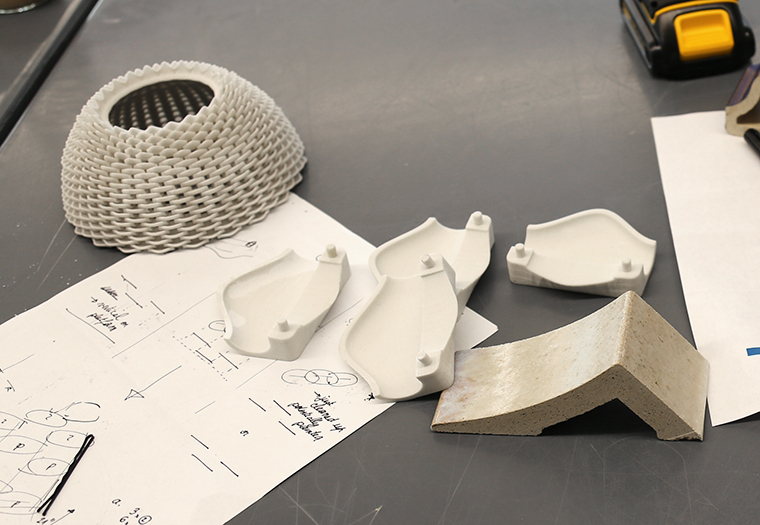 Studying the value of iridescence in ceramic glazes, Team University at Buffalo pursued the concept of passive illumination in their prototype at the 2018 Architectural Ceramic Assemblies Workshop. The team took inspiration from nature in their form creating an assembly of terra cotta tiles in two different glazes, resembling an insect wing and the pearlescent quality of seashells. 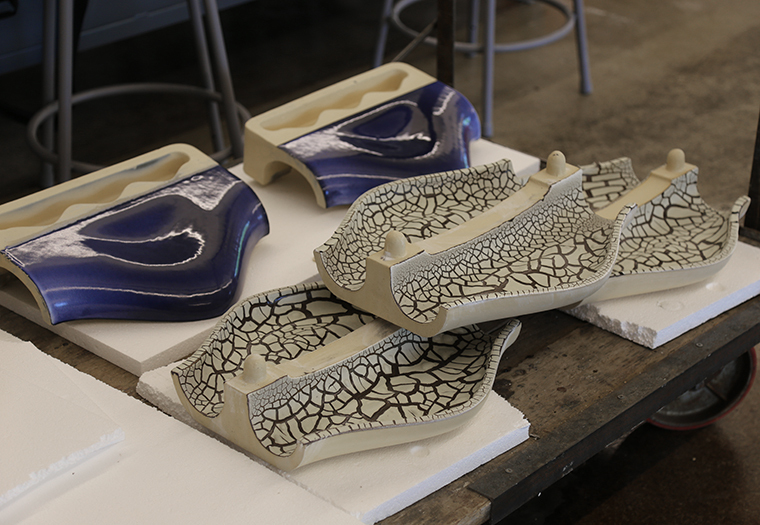 The glazes used on the final prototype are the result of many glaze experiments conducted by glaze artist, Christine Jetten. The glazed terra cotta panels feature varying levels of natural luminescence, celebrating the non-uniform beauty of the aesthetic outcome. Team AECOM gathers around their prototype for a counter-current heat exchanger before assembly. 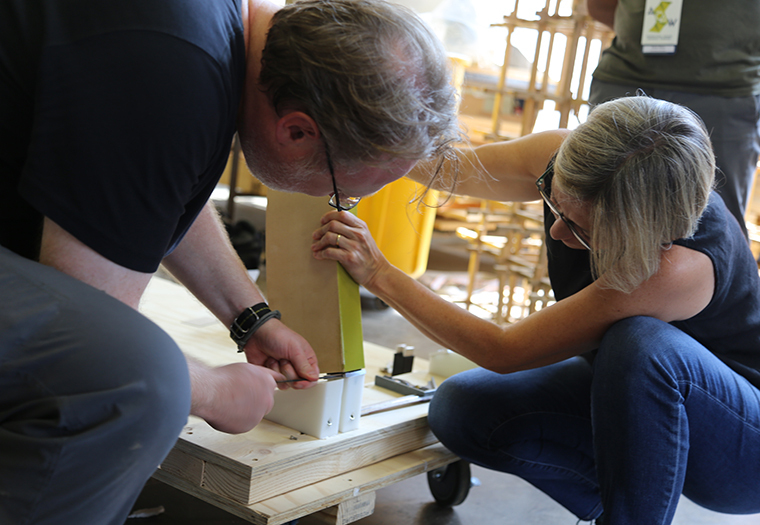 Participants from Team AECOM work to assemble their prototype, a counter-current heat exchanger. Returning for the third consecutive year, Team AECOM continues to explore bioclimatic design solutions at the Architectural Ceramic Assemblies Workshop. 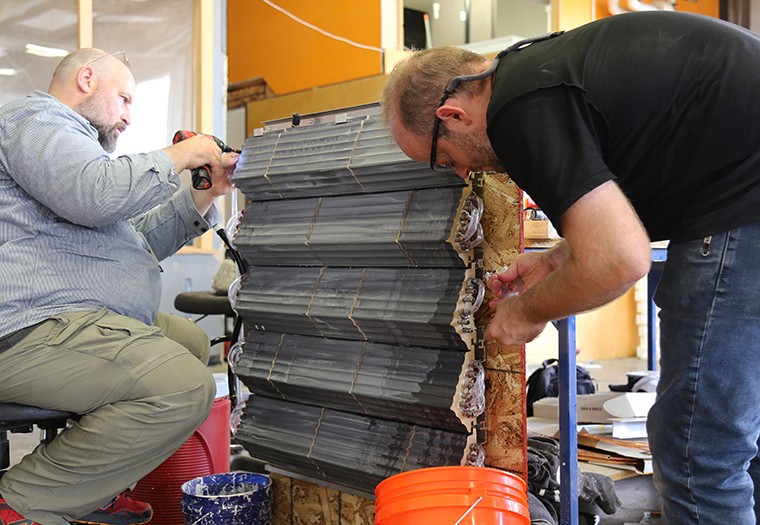 Their counter-current heat exchanger is comprised of a two-sided terra cotta wall system with an internal structure designed to transfer water between the interior and exterior terra cotta panels. Each year the prototype is modified to reflect knowledge learned through dedicated research and application to find the best method to harness solar gain and redistribute it to interior spaces. The exterior terra cotta features an angled profile and a black glaze in order to maximize the absorption of light and heat. Metal tubing transfers water heated by the sun to the white glazed internal wall which distributes the collected energy. The prototype undergoes thorough testing to measure its capacity to harness solar gain, furthering the team’s understanding and development of this design. 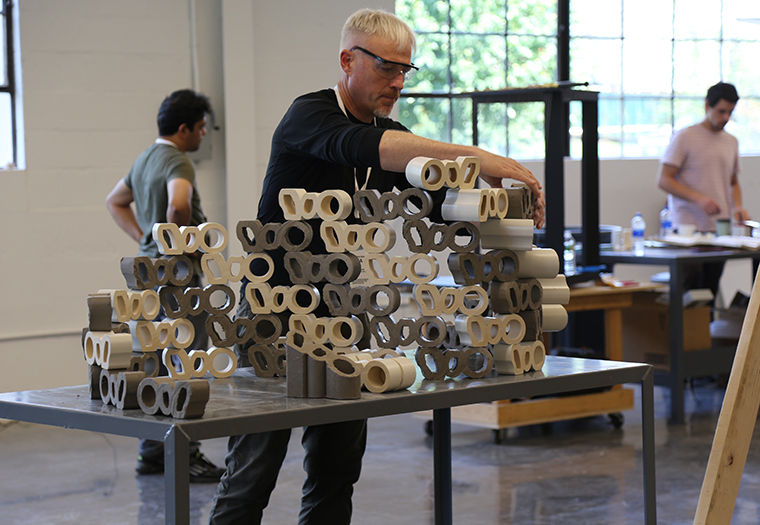 Craig Copeland, Senior Associate Principal at Pelli Clarke Pelli Architects, arranges extruded terra cotta pieces at ACAW 2018. Team Radical Matter explored combinations of extrusion with their 2018 ACAW prototype. 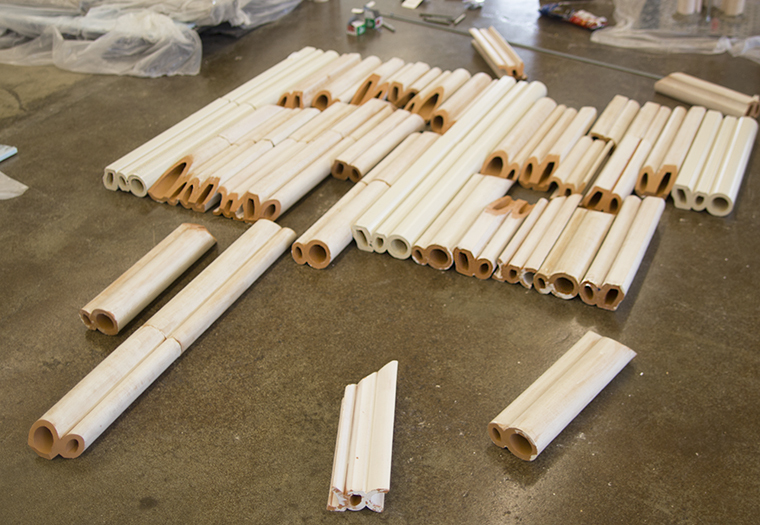 Team Radical Matter came together at the Architectural Ceramic Assemblies Workshop to investigate the design possibilites of terra cotta extrusions. The collaborators of this team produced over 700 lbs. of terra cotta extrusions using several different extrusion dies. Their experiments resulted in the creation of linear self-supported screens and walls with combined extruded units.